Andy Garside and Kevin Heaton, co-owners of GB Architectural. 'Picture: Kelly Gilchrist/FC Halifax Town. FC Halifax Town have unveiled their away kit for the 2016-17 season. The club have changed the colour of the away kit from last season’s white to orange, while Liversedge-based company GB Architectural will be sponsoring the club’s away kit for the next two seasons. Town chairman David Bosomworth said: “We’re extremely pleased to welcome GB Architectural as our away kit sponsors and for them to show their commitment over two years. 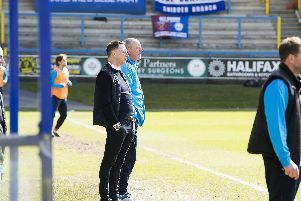 Andy Garside, co-owner of the company, said: “We wanted to put our whole hearted support behind the team and hopefully contribute to pushing them back into the National League.